Most of the electricity would be exported to Thailand. The plans for the massive 4,500 MW dam on the Salween River in Karen and Karenni state are contested through strong opposition from civil society groups. The Salween River (also known as Thanlwin or Nu River) originates in the Tibetan Plateau and flows through China, Myanmar and Thailand into the Andaman Sea. Being one of the few remaining largely free flowing rivers, the river ecosystem supports a unique biodiversity and is home to millions of people from many different ethnic groups. 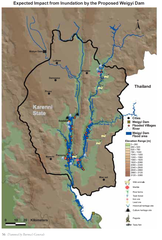 The Weigyi dam is a hydropower project proposed on the Salween River in Karen and Karenni state. It has provoked large civil society concerns over social and environmental impacts as well as potential human rights abuses [1,2,3,4]. The dam is part of a series of hydropower projects planned on the Salween River in Myanmar (see related conflicts, below). According to the civil society group Burma Rivers Network (BRN) , a Memorandum of Understanding between the former Burma regime and the Electricity Generating Authority of Thailand (EGAT) was signed on December 9, 2005. The dam would be located in Papun District, Karen State, close to Mae Hong Son Province, Thailand. Large parts of the reservoir would flood forests and agricultural areas in Karenni (Kayah) state. While Myanmar would receive foreign investment and income from electricity sale, most of the electricity produced is intended to be exported to Thailand, the group states . The project has been delayed, however, due to concerns over the reservoir’s impacts that would reach Thailand . The socio-environmental impacts are expected to be particularly severe in Karenni state, where the reservoir is located . Estimated to cover about 64,000 ha, the reservoir would irreversibly change a unique river ecosystem and flood biodiverse forests . Access roads into the forests for the dam construction would likely lead to increased logging in the area. Most severely, the reservoir would flood large areas of lowland rainforests and agricultural lands that are crucial for local indigenous livelihoods and cultures. Traditional farming, fishing, foraging and hunting activities would be dammed forever [see 1,3 for details]. 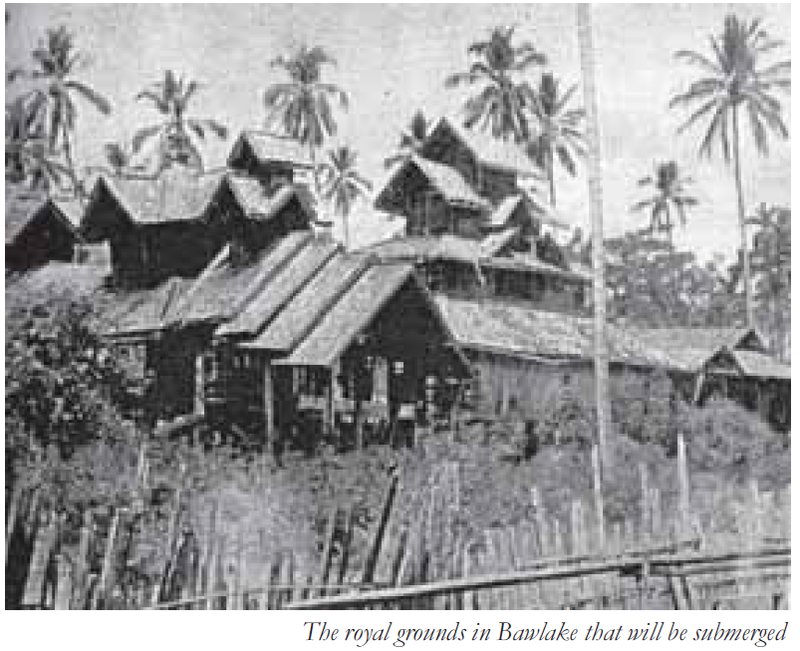 28 villages, including the ancient towns of Karenni, Bawlake and Pasaung would be submerged, BRN states [1, see also 3]. The Karenni Development and Research Group (KDRG) estimated that about 30,000 people would be affected by the flooded area [3, see also 1]. This estimate includes villagers currently living in the area, internally displaced people (IDPs) living in the flooded zone, IDPs and villagers having rice fields in the area, and civil war refugees who will be unable to return to their homelands. Given that the area is a conflict zone, civil society groups fear the dam construction would significantly increase tensions, threaten a fragile peace process and lead to further militarization. As seen with other dam construction cases in Myanmar (see related conflicts, below and 3), militarization is commonly accompanied by severe human rights abuses, including forced relocation, forced labour, forced land confiscation and violence [1,2,3,4]. Civil society organisations call for a stop of the Weigyi dam construction plans and for a moratorium of large dams, countrywide [1,2,3,4,5]. Hydropower development is highly controversial in Myanmar because of its severe social and environmental consequences, past human rights abuses caused in relation to dam construction , and their implementation in conflict areas, which further jeopardizes the peace process [1,2,4,7]. In 2014, more than 60,000 people and 131 civil society groups have signed a petition against the planned dams on the Salween driver . Companies involved: Myanmar Electric Power Enterprise (Myanmar); Electricity Generating Authority of Thailand (EGAT); possibly also Chinese companies Sinohydro Corporation; China Southern Power Grid Company and China Three Gorges Project Corporation [see 1]. In an article from 2003, the World Rainforest Movement reported an estimated construction cost of USD 6 billion . Potential Affected Population 30,000 people approx. Other Loss of traditional river trade routes, used by ethnic groups  Dam construction in Myanmar comes often with militarization of regions, which in turn has frequently caused human rights abuses, including sexual violence against women [3,4]. Why? Explain briefly. The plans for the dams are still there. So far it only has been delayed, but not cancelled. Suhardiman, D., Rutherford, J., Bright, S.J., Suhardiman, D., Rutherford, J., John, S., Putting, B., 2017. Putting violent armed conflict in the center of the Salween hydropower debates. Crit. Asian Stud. 49, 349–364. Burma Rivers Network on the Weigyi Dam (accessed online 03.05.2018).